Few things can ruin an adventurous road trip as quickly as a dead battery in a small town in the middle of nowhere -- and with no mechanic. 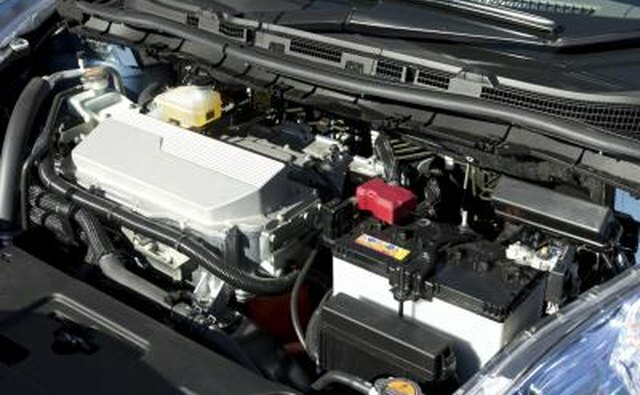 A car’s battery is essential to giving the starter motor the energy required to turn the flywheel until the engine reaches self-sustaining combustion. A few minutes of pre-departure preparation can determine if your battery is healthy enough to make the trip. 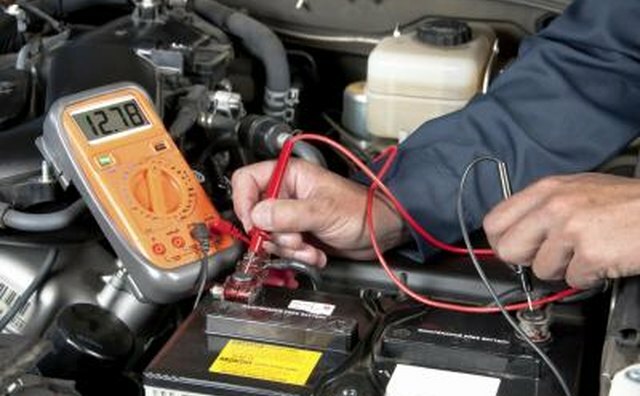 Testing the battery can also help determine if slow-starting is caused by the battery or another issue. Locate your car’s battery. 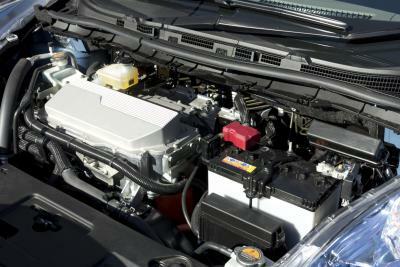 Most cars house the battery in the engine compartment under the hood, although some are housed in the trunk. Visually inspect the battery terminals and cables for corrosion, which appears as a greenish-yellow crust buildup. This corrosion may interfere with the multimeter readings. Clean any corrosion using battery-terminal cleaner and a terminal brush. Tighten loose cables. They are usually tightened with either a Phillips head screwdriver or a 5/16-inch nut. Insert the multimeter leads into the correct connectors on the multimeter. The black lead belongs in the black-colored connector, usually labeled "COM." Insert the red lead into the red connector labeled volts, ohms, milliamps. Do not use the connector labeled 10A, if your multimeter is so equipped. Turn the multimeter function dial to 20 VDC -- volts direct current -- or the closest direct current setting above 14 volts. The symbol for direct current is a solid line above a dotted line. Do not select an alternating current range, identified by a number above a squiggly line which resembles a tilde. Observe the multimeter display: It should read 0.00. Turn the car off. If the car is running when the battery is tested with a multimeter, the charge from the powered alternator will skew proper readings. Place the red multimeter lead on the red positive battery terminal and the black multimeter lead on the black negative battery terminal. Read the multimeter display. A reading of 12.4 VDC indicates a fully charged battery, 12.2 VDC is considered 50-percent charged and any reading below 12.0 volts indicates a dead battery. A charged, healthy battery will commonly provide 12.6 volts due to the output sum of six 2.1-volt internal cells. Instruct an assistant to crank the car's engine while you read the meter display. The voltage indicated on the multimeter should not dip below 10.0 VDC while the key is in the start position. A reading below 10.0 VDC when starting is a sign the battery is not producing enough current to reliably handle the starter motor's current draw. Turn the car off if it started in the previous step. Place the multimeter leads on the battery cable terminal end. It should read within 0.1-volt of the maximum reading displayed in step 3. Place the multimeter leads on the battery terminals swiftly and firmly. A loose or hovering connection may cause a startling electric arc. Keep your body parts and clothing away from the fan shroud in the engine compartment. It can turn on automatically and cause serious injury. Remove all jewelry before touching the battery terminals or cables. Do not allow any object to make contact with both battery terminals or cables at the same time. Do not use the 10A connector on the multimeter to measure voltage. Doing so may blow the multimeter's integral fuse or damage the unit.